Coldspring is a city in Jacinto County, Texas that is named after the Coldspring River and the Coldspring Battle, which gave Texas its independence. Settled in the 1850s, Coldspring has grown to a population of around 1,000 people spanning just over one square mile in the 77331 zip-code. 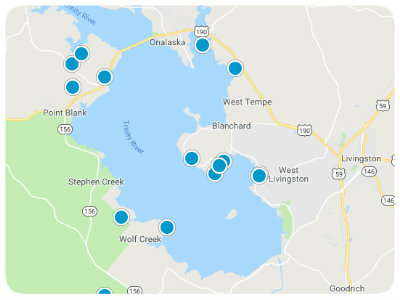 Prospective homebuyers who are looking to purchase a house for sale in Coldspring, Texas will find a myriad of options in proximity to Lake Livingston where folks can fish and boat, Double Lake, and the Sam Houston National Forest. 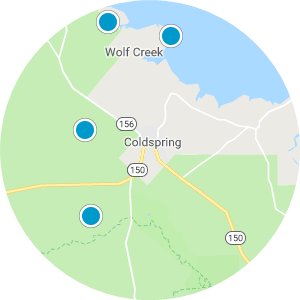 Camping, hiking, and of course fishing play a substantial role in the way of recreation in Coldspring, though there are antique opportunities, a plethora of golf courses nearby and the Coldspring Memorial Park in the area as well. Retreating home after spending time on Byrd Avenue and Church Street scouring the restaurants and conveniences is a joyous occasion in Coldspring thanks to the wooded scenery and peaceful atmosphere of the neighborhood. 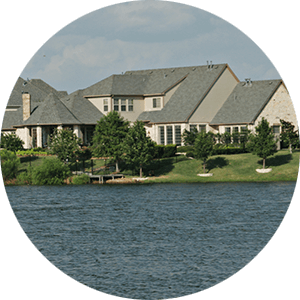 Properties in Coldspring, Texas with acreage and open floor plans with as many as four bedrooms can be discovered. Houses for sale in Coldspring near the 1887 Jail Museum are available as well as beautiful Coldspring real estate with ample privacy, cloaked in serenity and shaded by towering trees. 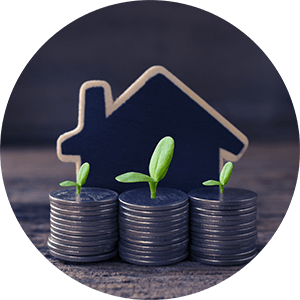 If you are interested in buying an affordable house for sale in Coldspring, Texas, please contact us today. Unrestricted corner lot at the entrance of Cedar Lake Estates. There is an A frame building in need of repair, do not enter. Being sold for land value, as is, where is. This prime acre of Hwy 150 for commercial or residential use, is a couple of miles from Coldspring courthouse and convenient shopping on the town square. 36 acres, mostly pasture with clusters of trees and a pond. UNRESTRICTED Ready for you to build your dream home !